We’ve been following Diego’s trial over the past year, and closing arguments are scheduled for this week. 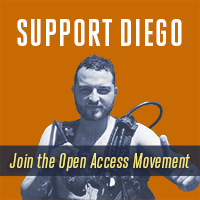 Today, we join open access allies all over the world in standing with Diego. EFF believes that extreme criminal penalties for copyright infringement can chill people’s right of free expression, limit the public’s access to knowledge, and quell scientific research. That’s particularly true in countries like Colombia that pay lip service to free speech and access to education (which are expressly recognized as basic rights in Colombia’s Constitution) but don’t have the robust fair use protections that help ensure copyright doesn’t stymie those commitments. Diego’s case also serves as a wake-up call: it’s time for open access to become the global standard for academic publishing. The movement for open access is not new, but it seems to be accelerating. Even since we started following Diego’s case in 2014, many parts of the scientific community have begun to fully embrace open access publishing. Dozens of universities have adopted open access policies requiring that university research be made open, either through publishing in open access journals or by archiving papers in institutional repositories. This year’s groundbreaking discovery on gravitational waves—certainly one of the most important scientific discoveries of the decade—was published in an open access journal under a Creative Commons license. Here in the U.S., it’s becoming more and more clear that an open access mandate for federally funded research will be written into law; it’s just a matter of when. The tide is changing, and open access will win. But for researchers like Diego who face prison time right now, the movement is not accelerating quickly enough. Open access could have saved Diego from the risk of spending years in prison. Many people reading this remember the tragic story of Aaron Swartz. When Aaron died, he was facing severe penalties for accessing millions of articles via MIT’s computer network without "authorization." Diego’s case differs from Aaron’s in a lot of ways, but in one important way, they’re exactly the same: if all academic research were published openly, neither of them would have been in trouble for anything. When laws punish intellectual curiosity and scientific research, everyone suffers; not just researchers, but also the people and species who would benefit from their research. Copyright law is supposed to foster innovation, not squash it. Please join us in standing with Diego. Together, we can fight for a time when everyone can access and share the world’s research.